Beautiful vegetables are essential to appeasing your neighbors when you grow your edibles in the front yard. Sure, your neighbors’ lawn might be brown in the summer heat and littered with white plastic resin furniture and toys. And their front patio is punctuated with hanging resin pots holding the desiccated remains of forgotten plants. But, growing vegetables in your front yard is pushing their boundaries and idea of the functions of a front garden. You need to dazzle them with a Violetto Artichoke. This spring, when I purchased some artichoke starts at Bi-Mart for a Master Gardener workshop, I also bought the last Violetto artichoke start for my garden. I tucked it into my victory garden with an added sprinkle of organic vegetable fertilizer and mulched it with an inch of leaf compost. The tag warned me that my Violetto artichoke wouldn’t bloom for the first season or two. Then, I promptly forgot about it. Until it pushed up a single stock adorned with two purple blooms. I was smitten. This artichoke is by far the loveliest plant I’ve ever grown in my victory garden. It is a short-lived perennial: only five years or so. Fall and spring are perfect times to plant artichoke starts. They are thistles and require excellent drainage and are heavy feeders. I give my artichoke a monthly drink of fish emulsion. When it’s done blooming, I’ll chop the plant back to about six inches high. It will regrow beautiful new foliage and then I’ll mulch it with leaves late this fall to help insulate it. I plan on adding a couple more to my garden. 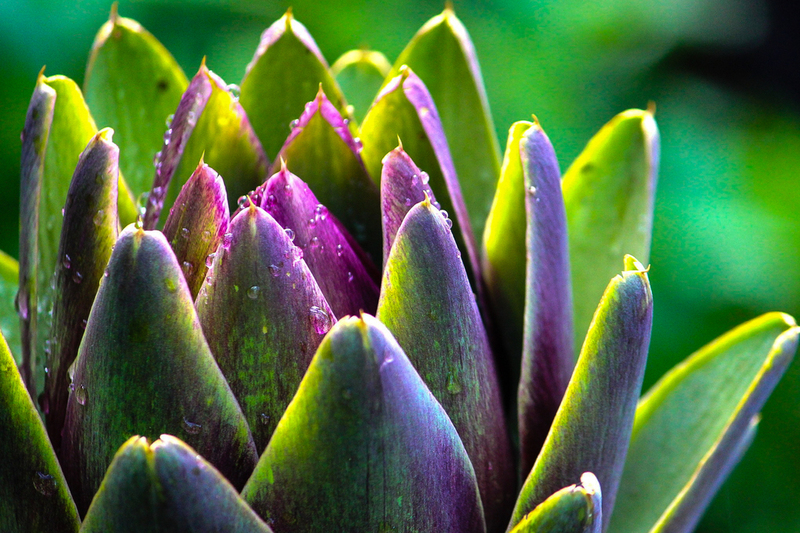 Violetto artichokes are known to be especially delicious artichokes. I let mine bloom and buy artichokes at the farmers market for my dinner plate. With a sharp vegetable peeler or a paring knife, I peel the skin off of the stem and base of the artichoke. Then, I cut off the top 3/4 of the bloom off. I spoon out the choke flower. And cut the whole flower in half from the stem up through the choke. I coat it in a seasoned egg bath, roll it in panko breadcrumbs and place it in a pan of hot glossy oil. I scoop it out of the oil when it turns golden brown. My Pirate loves to dip his fried artichokes in homemade ranch dressing, but homemade aioli works too. These make a lovely appetizer beside an ice cold glass of Rose.